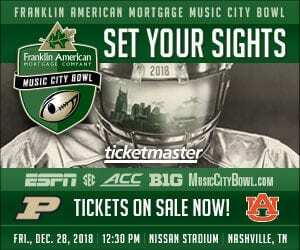 NASHVILLE, TN — Purdue University squares off against the Auburn Tigers for the first time Friday in the 2018 Franklin American Mortgage Music City Bowl at Nissan Stadium. This will be the 21st edition of this game, which usually matches a Big 10 team against an SEC squad, and has emerged as one of the better pre-New Year’s Day outings. Each team has notable things in its season resume, with Purdue being the team most responsible for keeping Ohio State out of the college football playoffs. They blew out Ohio State by 22 points, giving them their worse defeat of the year. They ended the year 6-6, becoming bowl eligible by blowing out Illinois 46-7. It is also the first time a Purdue team has played a game in Nashville since 1942, when they were shutout by Vanderbilt 26-0. Perhaps the most intriguing fact about Purdue was their second-year coach Jeff Brohm turned down the opportunity to leave and take the job at his alma mater Louisville. That surprised a lot of folks, but most certainly will be a rallying cry for the Boilermakers, who had a 5-4 record in Big 10 play, finishing second in the Big 10 West. Auburn annually has one of the top rosters in the nation, something that also leads to high expectation. They were nationally ranked early in the ear, but then faltered and finished with a 3-5 SEC mark. There were plenty of rumors regarding the job status of head coach Gus Malzahn, especially given the problems that they had all year offensively, both rushing and passing. 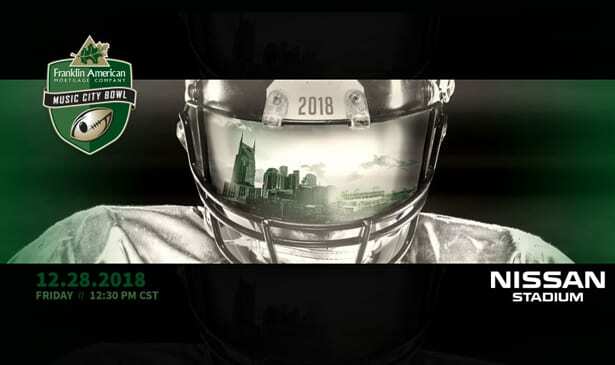 However Auburn enters the game as a 3 1/2 point favorite, which is no doubt attributable to them being an SEC team and this also being their second time playing in the Music City Bowl environment. 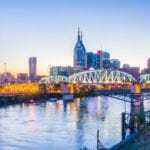 The Bowl also pays a huge dividend in terms of its direct economic impact to Nashville. Over its 21-year history it’s produced over $300 million in direct economic impact to the city, and enabled what’s usually among the slowest tourism weeks of the season to instead become among its more profitable.